“What is an ultramarathon?” Simple, it is any foot race longer than 26.2 miles. “Have you done many marathons?” No, I have never run further than 20 miles. “Why?” It’s hard to explain. Anyway, I realise that this is an immense challenge for me and could easily fail miserably or end in injury if I get it wrong, so I am doing a lot of research and have got Ian Sharman (2013 winner of the Leadville 100) to provide me with some coaching. I figured that if I am going to learn effectively I need to keep notes so I’ll post them here on the blog for easy reference, and hopefully they might be useful for you too. Purpose – It is too easy to go out running and cruise along at a nice comfortable pace but it won’t necessarily be an effective way to build your fitness. Ian suggests that every run should have a clear purpose and that generally these fall into one of the following categories – Recovery, Speed Training, Hill Training or Distance Training. Be Flexible – The problem with training plans (a bit like diets) is that people feel that they have to stick to it exactly for it to work. The result is that as soon as people miss a workout or fail to follow it exactly, they lose hope and motivation and everything goes out of the window. Be keeping things flexible and using the training plan as a guide rather than a rule book, you can do the best you can on any given day and keep adapting the plan to your constantly changing needs to ensure that you stick with it over time. Variation – When the body does the same thing over and over again, it gets acclimatised and doesn’t respond as effectively to training. Similarly, when you repeat the exact same actions over and over it increases the risk of injuries and also increases the risk that you’ll get bored and give up. Variation is your friend, so keep mixing up your distances, types of exercise, shoes, locations and whatever else you feel like varying. Strength & Stability – It is tempting to think that to get good at running, you just need to go out running a lot. However, the rest of your body is equally important as you don’t just run with your legs. Your whole body works in harmony to keep your posture strong and your running form smooth and efficient. When your core and upper body start tiring, your form deteriorates, your risk of injury increases and your mental fatigue starts to ramp up. Don’t Overtrain – Your body doesn’t get fitter when you exercise. It gets fitter when it recovers from exercise and builds itself back stronger than it was before. This means that recovery is equally important to exercise. If you don’t allow yourself to recover then you’ll gradually just burn yourself out. Ian told me that when approaching an event it is tempting to push hard to get extra training in but it can do more harm than good. If in doubt, “it is better to arrive at an event a little under trained than over trained“. Everyone’s body has a limit to how much training it can tolerate and keep improving. Like a maximum rate at which our fitness can improve. What we need to be doing is pushing ourselves while looking for that line. If we cross over it and feel that we are over training, we should back off a little, constantly adjusting our training to stay as close to the red line as possible. Focus on Form – In nearly all sports, we invest time in developing our technique to improve performance and reduce our risk of injury. Yet for some reason in running we seem to focus all of our attention on fitness and ignore technique altogether, as if it is somehow ridiculous that we would need to learn how to run. Some people are lucky and naturally run well, but don’t be cocky and assume that your technique is great – it probably isn’t. Good form makes you more efficient and reduces the risk of injury, so it is worth investing time in learning how to run properly. Injury is Your #1 Enemy – Over 50% of runners get a running injury each year that prevents them from running, sometimes for a few weeks, sometimes a few months and sometimes for years. When you’re training it is easy to think that you have to constantly push yourself, but the costs of injury are so high that it is always better to be cautious and back off the second you feel that something isn’t right. You can make up for it later, if only you aren’t injured. Keep it Loose – When you are doing a lot of running, especially when you are building things up and using muscles that have been somewhat neglected, you might find some pats of your body getting quite tight and achy. It is important to keep on top of this and some possible ways to do this are massage, foam rolling, dynamic stretching and yoga/pilates. Consistency – It is relatively easy to have one week where you do lots of exercise and go for at least one long, challenging run. However, it is quite another thing to do this every week. But consistency is the name of the game and even if you can’t do as much as you would like every week, it is important to keep it up and do as much as you can. Dare to Dream – It is easy to set yourself a target that you think is realistic, but what you really need is a target that excites you. Dare to set yourself the target that you really want and don’t feel afraid to try. Just turning up on the start line of an event that you think is bordering on impossible is in itself a noteworthy achievement. Better to have tried and failed than to never have even tried. It will be interesting to see how well I manage to follow this initial advice over the coming months, but I think the above 10 points provide a pretty good starting point and some very interesting food for thought. If you have other tips that you’d like to share, please feel free to leave a comment. 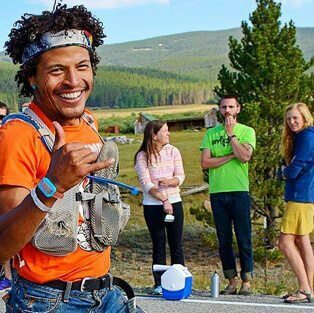 The photo above is of Barefoot Alex achieving his dream of completing the Leadville 100 this year, and look at that smile on his face! UPDATE: So a few months have past and I achieved a lot, with 10 minutes shaved off my half marathon pb, my run distances increased and more importantly, the distance that I can motivate myself to run alone increased to about 12 miles. However, a number of things eventually got the better of me and made me realise that it is not the right time. These things taught me the most important lessons of all. Weaknesses – You are only as strong as your weakest link. It doesn’t matter how strong you are, if you have a weakness that is letting you down then you won’t progress until you overcome that weakness. I found a little niggle in my lower back started causing problems as the distances increased. Time – The bigger the distance you are training for, the more time you need to spend training. Not just that, but the long runs get really long. This sounds obvious, but you need to think through the practicalities and figure out whether you actually have that much time available, and whether you wan to spend that much time running. In my case, it turned out that the answer was no. Motive – You need to have a clear reason in your mind to justify your training to yourself. As the training gets tougher and more time consuming, its easy to forget the original motive. It also makes you question whether the original motive was really valid. In my case, the truth is that I just want to enjoy running and keeping healthy. As the pressure mounted, I realised that I didn’t need to push myself so hard to achieve my real goals.